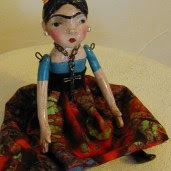 I've been working on creating my Ning social network for my on line doll class and a place for doll enthusiasts. If any of your are on the 29 Challenge that started in November 2008, you may remember that that was when I committed to doing the on line class. Instead I wrote a booklet on doll making. That's like me. So I continue to keep my commitments this year. Wish me luck! This has not been easy for me but I am finally finding my way around Ning. I started designing the pages but can't really figure out how to make it a private, invitation only group. It's not that I want to be exclusive but I guess because I'm trying to do an on line paid for workshop that's part of it. I can't seem to get that yet. I'll continue to work on this today and get back to you. I've also been tagged by 2 of my favorite friends. I'll do that later today also. Right now it's off to take the kids to school. It's 40 below wind chill here and much too cold to wait outside for the bus. I'm back for a moment. It's still cold. The kids are back from school and I did figure out some of the Ning stuff. Yea! I made my badges, found the pay pal button download, and actually found out how to make it a private group. Yea! Yea! Yea! I am doing an on line workshop from the booklet I wrote. I will be making several videos and there will be open discussion and questions and answers. This is not a difficult doll to make but I have a lot of other ideas for the other kinds of dolls that I also make. The class will cost and much like the Suzi Blu virtual art academy, I will just add to the workshops as I finish them. I will post a badge to the site for those of you who want an invitation to the class. I'm not sure of the price yet. My next hurdle is the video. That is scary. So something new once again today. I am letting og of the past that has kept me bound to mediocre. Some time I will let it all out and tell of you the exact nature of the broken pieces of my life. I am a survivor and I will continue to survive. Nancye I would love to take your online class. I have just returned from Australia and gave your artwork to Miss Katie who was last seen dancing around the Christmas tree. Before her double lung transplant, she had never been able to dance. What a joy it was to hold her mum's hand and share this moment with her, with special thanks to the Village People's YMCA! !